I spent my honeymoon in Fira, Santorini, after our destination wedding in Italy! We planned a last-minute boat tour around the island and we’re so glad we did! Read below to find out who we toured with, what we saw, and tips for when you take a boat tour! We spoke to the employees of the Ariana Apartments, where we were staying, and asked them for a recommendation. They told us to use, Spiridakos, saying that it was the best on the island. Whether they truly believed this or they said this for some kind of commission, didn’t matter in the end because it really was a great tour! If you’re traveling to Santorini, I recommend booking a tour with Spiridakos Sailing Cruises on board the Catamaran Happy Days! The company has a wide variety of services and sizes of boats to choose from. We were looking for a smaller tour group size. (Didn’t feel like sharing our honeymoon with 30 strangers). We were lucky enough to book a tour on a boat that fits 14 people maximum. Since it was a last minute booking during the off season, we were the last couple to join, making it a total of only 11 people! Hooray for small groups! The company provides pick up and drop off from your hotel. A van picked us up from a few minutes from where we were staying –this is when we paid for our tour. Only one other couple was in the van for the ride to the port. Our driver pointed out various tourist attractions and provided humorous anecdotes during our 30 minute drive. At the end of the tour, all of the passengers got into a large van and were dropped off at their respective hotels (or close to their hotels). Spiridakos also provided an amazing lunch (see below for more details) and had a wonderful crew! Below is a list of everything we saw on our tour. Our first stop on our morning sail was the into the flooded caldera to swim into the volcano. Technically there are two volcanoes; the dormant volcano is separated from the active volcano by a small strait of water. The larger of the two houses the active volcano and is known as Nea Kameni. The last eruption was in 1950. Tourists can sail to the island and view its crater by foot. Or you can sail into the volcano and swim in its hot springs. The golden colors along the volcanic edge is caused by the large amounts of sulfur in the water. The older volcano, known as Palea Kameni, is no longer active and is covered with vegetation. I’ve seen some reviews for the Hot Springs saying that it wasn’t worth it the trip, but I enjoyed our time into the volcanoes. It was still an interesting experience and a chance to get close to an unusual volcano. I say, if you have the money and time, go for it! Next stop on our tour was a popular diving spot. The waters are crystal clear and you can see into the depths of the ocean at this spot. The colors are beautiful. I’ve read that scuba diving is better in Santorini than snorkeling because there is more to see, like caves and sunken ships. Snorkeling was a short distance away. I’ll be honest and say that snorkeling was not that great. But, when in Greece, jump off the boat and go snorkeling! Only 3 of us made the jump into the cold water to snorkel. There was only one kind of fish that I saw, and not a lot else. I did see evidence of coral bleaching, sadly. If you have never been snorkeling, don’t be dismayed by the lack of fish and ocean life surrounding Santorini. Don’t give up on the popular activity and try snorkeling on another trip. The White Beach is located near the village of Akrotiri. The beach gets its name from the white cliffs looming over the slender beach of white pebbles. There is only way to reach White Beach: by water. (Apparently there is a path but its difficult to trek). You don’t need to take a boat tour to visit this small, secluded stretch of beauty. There are water taxis traveling between the Red and White Beaches. 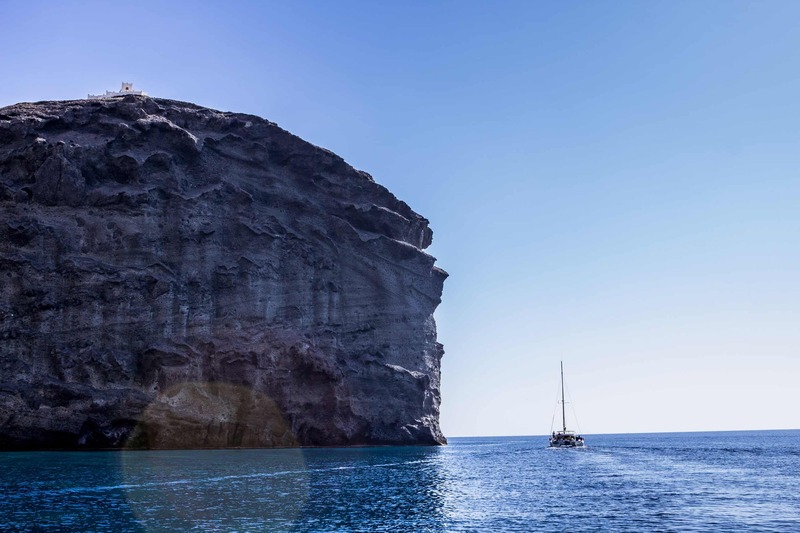 One of the most amazing sights in Santorini are the massive granite cliffs protruding into the ocean. You sail extremely close to them during the tour. Our last stop, after a delicious lunch (read more about it below), was the Red Beach, named for the red volcanic rock. The beach is not that large and popular so prepare for crowds if you’re visiting during the summer. It did not look to crowded from the boat during mid-October. If you go to any of the beaches in Santorini, you’ll want shoes with decent soles. The beaches are more rock than sand and can be hot on your feet (especially the Black Beach). To access the Red Beach, you can take a boat and swim to shore, or drive and park your car in the lot nearby. Its a short walk from the parking lot, over volcanic rock, to the beach. It was our last chance to go for a swim, too. Only two people, including my husband, decided to jump into the cold water one last time. There was enough time for those who wanted to swim to shore and back to the boat before our tour was over. Swimsuit! Note: your swimsuit should not be white. If you get into the hot springs, the sulfur will stain your suit. Do not wear jewelry (or have somewhere to store it). The sulfur will damage several types of metals and you risk losing precious items in the sea. Jacket and Pants. Our morning sail was chilly, especially with the wind while we were sailing. It was really only hot enough to be in our bathing suits alone when the boat was not moving. Sunglasses. Protect those eyes! See below for a link to a pair my husband wore. Sunscreen. Protect your skin! Bring some with you if you burn easily, especially since you will have the chance to jump in the water twice. Do not need to bring a towel. If you sail with Spiradikos, they provide beach towels to you. But feel free to bring your own (it can always be used as a blanket). See below for a suggestion for a travel towel! Camera/Phone. You will regret not capturing the sights. The crew was also happy to take photos for people so have your phone or real camera handy! See below for a link to a waterproof case. If you have an underwater camera, bring it for snorkeling and swimming into the volcano! It won’t matter what kind of shoes you decide to wear on your tour with Spiradikos. Before you step onto the boat, you’ll remove your shoes and place them in a basket. You won’t see them again until you exit the boat. We only brought enough cash to pay for our tickets in person. That was a mistake. There was a jar on board for tips and we were unable to show our gratitude. Our crew was amazing and provided such an enjoyable meal and time for us that we felt awful about not being able to tip them well at the end. The crew works long hours, almost all year long, and do so because they can’t afford not to on their wages. Please bring cash! The crew of Happy Days deserved it! Should You Bring a Bag? Feel free to bring a small bag on board. There is a place to set your things inside the boat and you’ll have access to it at any point during the tour. The only item you won’t have access to are your shoes. Lunch was provided on Happy Days (Spiradikos) and it was amazing! We went on a sunset cruise in Los Cabos for my birthday earlier in the year and we ate snacks for our dinner on board. I was expecting the same on this trip, but was pleasantly surprised by a full meal! We were served pasta, chicken, huge shrimp, salad, bread, and more. Half of the guests sat on the stern, while we sat with another couple inside the boat. We had a wonderful conversation with the other couple and our guide. Throughout the tour you’ll be offered a beverage. You’ll have the choice between alcoholic and non-alcoholic. Get ready for some day drinking! Drinking a beer while basking in the sun on a sail boat is really the only way to drink a beer. Right? Day drinking brings me to this tip. There is a restroom on the Spiradiko’s sailboat. Take advantage of this before heading back to port! I did not and regretted it on the drive back into town. You read that right. The Santorini Tomato Museum. On our drive to the port our driver pointed out the museum as a tourist attraction. The tiny, cherry-sized tomato watered purely by morning dew is a staple on the Island, so much so that a museum was dedicated to it, out in the middle of nowhere (or so it seems). It’s located in the original tomato canning factory. It only costs €5 a person and can be seen on your way to Vlychada Beach, also known as Black Sand Beach. The Lighthouse was built in 1892, making it one of the oldest in Greece. It is located around 15 km from Fira, a quick drive from the capital, and accessible by a road from Akrotiri village. You cannot enter the lighthouse, but you can walk around outside, along the cliff’s edge for stunning views. The spot is most popular for sunset. Another attraction of Santorini, pointed out to us by our driver, is the Monastery, sitting high on a hill on the south side of the island. It was built in 1712 between Pyrgos and Kamari villages. It offers wonderful views of the island since its on the highest peak in Santorini. Click here for more information. Here are some items I recommend to bring along on your boat tour of Santorini. I am no longer an Amazon Affiliate member so the links attached to the images below may no longer work. But I still recommend these products so I’m leaving the images for my readers’ reference. Mpow Waterproof Case, New Type PVC Waterproof Phone Case, Universal Dry Bag – just in case your clumsy, want to bring your phone swimming with you, or are just very cautious. Persol PO 3019s 52 MM Black Frame/crystal green Lens Sunglasses – These are similar to the pair my husband is wearing in the photos from our Italy and Santorini trips. Syourself Microfiber Sports & Travel Towel with Travel Bag & Carabiner: 60″x 30″ 1 pack. What was your favorite activity when visiting Santorini? Haven’t been yet? What are your plans?